It’s truly strange how Democrats’ collective minds work. What minds! Their minds rotted away, long ago, from liberalism. 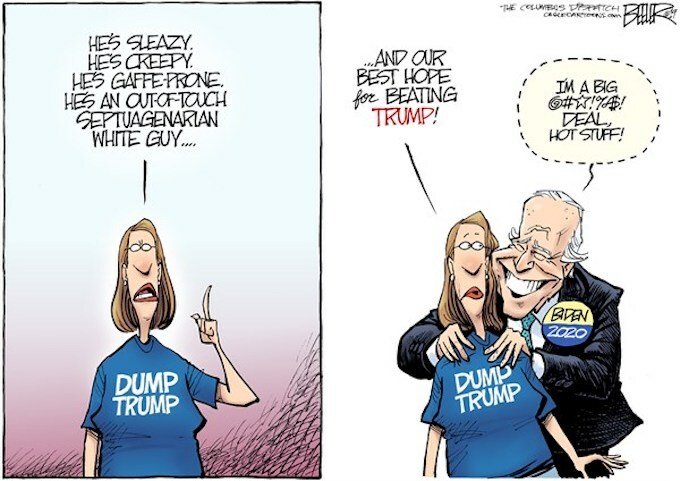 Let’s investigate Biden to the same extent they did Trump until the 2020 election and see what happens next…. The rinos would never go for it, let alone the lame stream hacks..
2many … you hit on something I’ve been pondering ever since Trump was elected: when and if we are ever STUPID enough to allow another DemocRAT POTUS, will we have the guts to attack him/her/it regardless of which “victim group” that person comes from? Have Repubs learned how to attack them relentlessly? Nope. THEY STILL have yet to find their collective spines..
Biden is using the same campaign strategy used by Obama, don’t say how you are going to improve American lives, just denigrate the opposition. The liberal media will protect the lecherous behavior and the unintelligible gibberish. Nice cartoon. I’m surprised he wasn’t putting his tongue in her ear. Just needs Klinton standing on the other side with his pants down….